"Jerusalem is Palestinian land and I hope Palestine will be a member of United Nations. It is the UN's obligation to do so," said Turkish foreign minister Ahmet Davutoglu at the "International Meeting on the Question of Jerusalem" in Ankara. Turkey's Foreign Minister Ahmet Davutoglu has said those people who do not understand the importance of Jerusalem and Palestinian rights there are "attacking the conscience of humanity." Speaking in the opening ceremony of "International Meeting on the Question of Jerusalem" in the Turkish capital, Ankara, on Monday as part of the International Year of Solidarity with the Palestinian People, Davutoglu said there are three steps to be aware of when discussing Jerusalem. "We should be aware of the areas of ethical and ontological, cultural and political responsibility for Jerusalem," said Davutoglu. Davutoglu recalled that under the terms of international law, the city of Jerusalem is regarded as under occupation, and there were two major problems to consider under this framework, those being refugees and Jerusalem's legal status. "We are witnessing occupation of Palestinian lands since 1948, as well as Al-Aqsa Mosque. 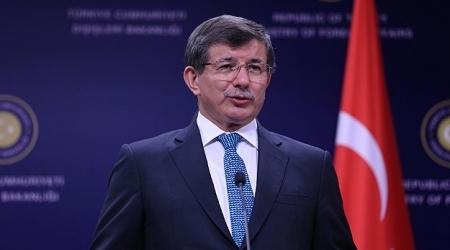 The international community should ensure justice and the rule of law through different platforms," said Davutoglu. "If the UN decisions are not being implemented, then why they were taken in the first place?" The tensions ongoing between Arabs and Israelis since WWI erupted in November 1947, when war broke out between Israel and a military coalition of Arab states and Palestinian forces. The UN General Assembly's offered a Partition Plan to divide the area into an Arab state, a Jewish state and the Special International Regime for the City of Jerusalem -- this led to another war, commonly known as the 1948 war for Palestine. Israel took control of 60 percent of the Palestine lands, defended by a UN resolution. The city of Jerusalem has been the object of conflicting claims by Jews and Palestinian Arabs, as both peoples consider it an irreplaceable part of their national essence. Israel, which annexed East Jerusalem in 1980, says that the entire city is the capital of Israel and must remain under Israeli sovereignty. This claim is not recognized by the international community. Davutoglu also recalled that Al-Aqsa Mosque is a sacred site for Muslims and cannot be occupied. "Nobody can take sole authority over Jerusalem, peace in the Middle East is impossible without it," said Davutoglu. "Jerusalem is Palestinian land and I hope Palestine will be a member of United Nations. It is the UN's obligation to do so." Davutoglu called on the international community to form a charity campaign for the Palestinian people who are "in deep sorrow." The Ankara meeting is jointly organized by the UN's Committee on the Exercise of the Inalienable Rights of the Palestinian People, the Organization of Islamic Cooperation and Turkey. Speaking after Davutoglu, Organisation of Islamic Cooperation Secretary General Iyad bin Amin Madani thanked Turkey for its efforts towards protecting the rights of Palestinian people. "The incidents in 1948 were effective in forming the Islamic Cooperation Council. 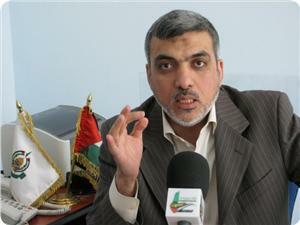 We see ourselves as the protectors of the Palestinian people," said Iyad. "The city should be given to Palestine. Islamic Cooperation Council is worried over the implementation by Israel on Jerusalem. They are trying to erase the city's Arab identity and erase religious history." Mehmet Gormez, Head of the Turkish Directorate of Religious Affairs, was also present in the meeting. Political bureau chairman of Hamas Khaled Mishaal reached Turkish premier Recep Tayyip Erdogan over the phone on Tuesday and congratulated him on his party’s election victory. Mishaal expressed the Palestinian, Arab and Islamic masses joy over this big election victory of the Justice and Development Party (JDP) in the local elections. 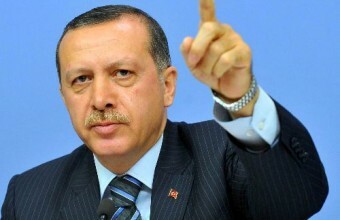 He also appreciated Turkey’s honorable stands in support of the Palestinian people and their just cause. He hoped more progress and development for Turkey under leadership of the JDP. Mishaal made a similar phone contact with Turkish foreign minister Ahmet Davutoğlu congratulating him on the JDP municipal elections victory. For his part, Mahmoud Abbas, the Palestinian Authority president, congratulated Erdogan on his party’s election win over the phone on Tuesday. The JDP won 46% of the votes at the municipal elections held last Sunday while its nearest opponent won 28%. Despite their political differences, rival Palestinian factions Fatah and Hamas on Monday congratulated Turkish Prime Minister Recep Tayyip Erdogan on his AK Party's electoral victory. "We [Fatah] respect the will of the people and the results of the ballot box," Fatah spokesman Osama Qawasmi told Anadolu Agency. He noted Turkey's support for the Palestinian people and for Palestine's recent bid for statehood at the United Nations. 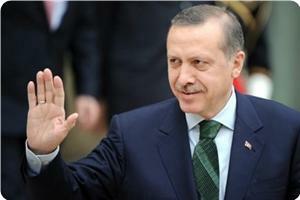 "We wish Turkey further progress and stability," Qawasmi added. Unofficial results of Turkey's local elections show Erdogan's AK Party winning the majority of local council seats. According to preliminary results, the AK Party garnered 47 percent of the vote, placing it well ahead of the main opposition Republican People's Party (CHP), which only won 27 percent. With over 60 percent of the votes counted nationwide, the CHP stands at 27 percent; the conservative National Movement Party at 14 percent; and the Kurdish Peace and Democracy Party at 3 percent. 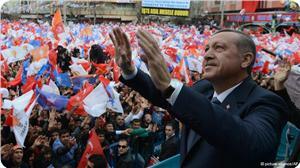 Speaking to cheering supporters at AK Party headquarters in capital Ankara, Erdogan hailed the "great" electoral victory. The election results are likely to set the tone for a busy polling schedule in Turkey, which will choose a new president in August before holding a general election in July of next year. Meanwhile, Hamas – which has governed the Gaza Strip since 2007 – also congratulated Erdogan on his party's solid electoral win. "We congratulate Turkey on its democratic success; we hope this election will encourage more development and progress in Turkey," Gaza government spokesman Ihab al-Ghusain told AA. He went on to voice hope that the election results would encourage Turkey to extend further support to "persecuted peoples" and the Palestinian cause. "Turkey has always adopted stances supportive of the Palestinian cause," al-Ghusain said. "And we believe these poll results will serve to further bolster the Turkish government's support for the Palestinian cause." Meanwhile, Hamas spokesman Sami Abu Zuhri attributed the AK Party's electoral victory to its "great efforts" at the local level and its admirable positions vis-à-vis the Islamic nation in general and the Palestinian cause in particular. "We're confident that this victory will be used to serve Turkey's best interests," Abu Zuhri told AA. "It will also be used to boost Turkey's influence at both the regional and international levels." Member of Hamas' political bureau Ezzat Al-Resheq said that the victory of Turkish premier Recep Erdogan would upset the Israeli occupation and all those who bet on the failure of his political party because of his brave positions towards the Arab and Islamic issues, especially the Palestinian cause. Resheq stated on his facebook page that this win would positively reflect on the Palestinian cause, especially since Turkey under the government of Erdogan strongly stood in the face of the Israeli injustice and supported the Palestinians' rights. Senior Hamas official Wasfi Qabha, for his part, said the Turkish Justice and Development party, which achieved a great victory in the municipal elections, has become an archetype of the Islamic political parties in the region. Qabha stated that the repeated wins of Islamists in the political arena in Turkey reflects the wise policies pursued by the ruling Justice and Development party. "When the Islamists have the opportunity to serve their people, they creatively work and represent the values of purity, transparency and dedication," the Hamas official emphasized. In a press release on Monday, the Hamas Movement congratulated the Turkish people and their government for the success of the municipal elections. The convenient local election victory earned by the quasi-Islamic ruling party in Turkey, headed by Recep Tayyip Erdogan, is a very bad news for the enemies of freedom and enemies of Islam in the region and beyond. It is bad news for the ultra-secularist but-sectarian-minded enemies of Islam at the Turkish arena who have been making rabid efforts of late to scuttle Turkey's successful Islamic experiment. These forces, eager to take Turkey back to the days of military tyranny, have been organizing vociferous protests against the government. Their demands had a thin façade of legitimacy as they raised slogans against government despotism and corruption. However, their real opposition centered on Erdogan's Islamic approach. They simply wanted Erdogan to turn his back on Islam, something that no dignified and honorable Muslim could ever do. Alawite Turks, who follow a pseudo-Islamic sect which believes that Ali ibn Abei Taleb was God-incarnate, has been infuriated by Erdogan's support for the Syrian revolution against the murderous Alawite regime in neighboring Syria. The truth of the matter, however, is that Erdogan's stance against the Assad regime doesn't stem from any sectarian considerations but is the result of the bloody and nefarious nature of the Damascus junta. In the final analysis, a regime that murders his people at will and wantonly destroys his country in order to remain in power is a diabolical regime par excellence. Second, Erdogan's elections victory must also be bad news for Israel and its Free Masonic and other anti-Islam agents in Turkey itself. Indeed, ever since the advent of Erdogan at the helm of power in Turkey more than ten years ago, Turkey has been a consistent supporter of the just Palestinian cause. This support, especially to Hamas, the Palestinian Islamic liberation movement, infuriated Israel which always viewed the Turkish republic as a satellite-state orbiting Talmudic Israel, a criminal state that is hell-bent on ethnically cleansing the Palestinian people and crushing any efforts on the part of the Muslim Umma to reinstitute the rule of Sharia. Needless to say, the rule of Sharia is the ultimate anathema for Israel because a truly Islamic state will never accept or come to terms with the arrogation of Palestine by Zionism. Erdogan's victory is also bad news for the Sissi gang in Cairo. Sissi and cohorts have been trying desperately to tarnish the image of the Turkish Prime Minister who had the courage to condemn the fascist coup in Cairo against the only democratically-elected President in Egypt's history. 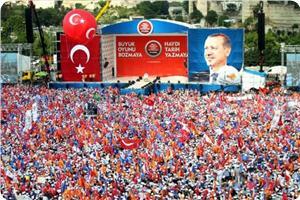 The United Arab Emirates and Saudi Arabia must be very disappointed by Erdogan's victory. The decadent rulers of both states calculate that the success of any Islamic democratic experiment anywhere in the world will expose the utter depravity and moral bankruptcy of the tribal regimes in their respective countries. Hence, reinforcing Erdoganism is the antithesis of what these corrupt despots hope for. Finally, the main Shiite powers of Iran, Iraq and Hizbullah, must also be greatly unhappy with Erdogan's victory. For them, the strength and stability of any Sunni Muslim country interferes with and seriously undermines efforts at spreading Shiite hegemony in the region. We in Palestine are quite happy that Erdogan and his party have been able to democratically defeat their enemies who are actually the enemies of Turkey and the enemies of Palestine and Islam. We hope that Turkey, our big sister to the north, will continue to grow both quantitatively and qualitatively for the glory of the Turkish nation. The Hamas Movement welcomed the outcome of the municipal elections in Turkey and described it as a triumph for the Turkish democracy and the ruling party that strongly supports the Palestinian cause. In press remarks to Quds Press, senior Hamas official Salah Al-Bardawil hailed the democratic experience in Turkey and said that the victory of the Justice and Development Party represented a popular reaction towards the Turkish government that has always respected its people and defended their rights. "The Islamic Resistance Movement of Hamas sends its warm congratulations to the Turkish leadership and its people on these elections. This leadership has understood that its respect for its people is the way to win their confidence and the Turkish people has returned the favor with this splendid result," Bardawil stated. "The reason behind our happiness at the victory of [Turkish premier Recep] Erdogan and his party is his closeness to the Palestinian cause because our assessment of any one depends on the level of his attachment to Palestine," the Hamas official added. Almost one year after Obama asked Netanyahu to apologize for the death of nine Turkish nationals during the 2010 Gaza flotilla raid, talks with Turkey hit a dead end. Turkish Prime Minister Recep Tayyip Erdogan told U.S. President Barack Obama last week that the delay in signing an Israeli-Turkish reconciliation agreement is entirely the fault of Prime Minister Benjamin Netanyahu. A senior Israeli official involved in the talks with Turkey denied that Israel is to blame for the delay. The Turks are at least equally to blame, if not more so, he said, adding that there are still disputes between the sides that are preventing the deal from being finalized. Erdogan conveyed his message in a telephone call with Obama last Wednesday, Haaretz has learned. The conversation dealt with a long list of issues connected to the situation in the Middle East, including the ongoing efforts to end the crisis in Turkish-Israeli relations that erupted following Israel’s botched raid on a Turkish-sponsored flotilla to the Gaza Strip in May 2010. After that conversation, the White House issued a brief statement saying that Obama had urged Erdogan to finalize the agreement and normalize relations with Israel. But Israeli sources who were briefed on the details of the phone call said the two leaders actually held a lengthier discussion of the issue than the statement indicated. 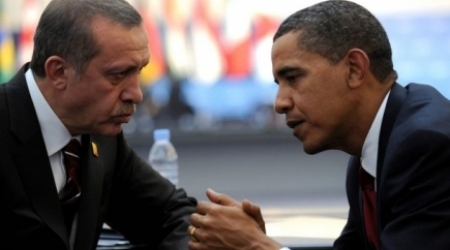 According to the Israeli sources, Obama told Erdogan that almost a year had passed since Netanyahu called the Turkish leader and apologized for the deaths of nine Turkish nationals during the raid. That phone call, which took place during Obama’s visit to Israel, was personally orchestrated by the U.S. president, and it was supposed to launch negotiations between the two sides on a reconciliation agreement. Obama had expected those talks to be concluded within a few months, he told Erdogan, but a year later, nothing had happened. Erdogan then told Obama that over the past few weeks, the negotiators had finished preparing a draft agreement that was supposed to restore normal relations. But Netanyahu hasn’t yet responded to the proposed agreement, Erdogan said, and is thereby delaying an end to the crisis. 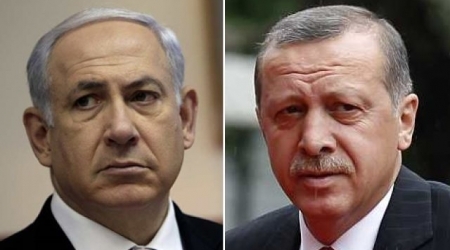 “The ball is now in Netanyahu’s court,” the Israeli sources quoted Erdogan as telling the U.S. president. Obama then told Erdogan that he is supposed to host Netanyahu at the White House next Monday and that at this meeting he will demand the reconciliation deal be finalized promptly. Israeli and Turkish negotiators finalized the draft agreement four weeks ago. The draft was then brought to Netanyahu for approval along with the negotiators’ recommendation that he sign, but he delayed making a decision. As the days passed, some on the Israeli side began to fear that Netanyahu had changed his mind about reconciliation with the Turks. They also worried that if he didn’t approve the deal swiftly, somebody in either Turkey or Israel would do something to reshuffle the deck and push reconciliation further away, as had occurred more than once in the past. And indeed, that’s exactly what happened. A few days later, Erdogan once again declared publicly that he wouldn’t normalize relations until Israel ended its blockade of Gaza. One theory in Jerusalem is that Erdogan’s statement stemmed from anger at Netanyahu’s delay in approving the agreement. Over the past few weeks, the negotiations have entered the deep freeze, and Israel’s assessment is that no further progress will be made until after Turkey’s local elections on March 30. This conversation came almost three weeks after Turkey and Israel agreed on a draft agreement for mending ties between them, newspaper said. Netanyahu refused to approve the agreement and Erdogan recently demanded that Israel has to lift its siege on the Gaza Strip as a condition for normalization. Haaretz revealed that as part of the draft agreement, Israel would pay compensation of some $20-23 million to the families of the Turkish citizens killed and injured by Israeli occupation forces during the Gaza Flotilla incident. The agreement also includes Turkish agreement to pass a law that would lead to cancellation of lawsuits filed against soldiers who had participated in the raid, and an outline of the diplomatic normalization. Despite the malicious campaign of vilification and hateful propaganda by Zionists-and also by some anti-Islam Arab traitors- targeting the man and his leadership, Turkish leader Recep Tayyip Erdogan is proving himself once again a man of principles and honor. The Zionist enmity to an Islamic or even semi-Islamic Turkey is well known and almost axiomatic. The more Turkey- or any other state or people- leans toward Islam, even a liberal form of Islam, the more such a state and people are despised by Zionism and western powers at Zionism's beck and call. The reason is simple. Islam urges Muslims to be just and stand morally upright. Hence, Muslims naturally reject Israeli criminality and aggression against the Palestinian people, especially the lebensraum policy adopted by the Jewish state in the West Bank. Israel hates it so much when an Arab or non-Arab Muslim state incorporates some Islamic elements into its domestic and foreign policies. Israel wants the Muslims of the world to forget Palestine and the Palestinians, the vast majority of whom are Muslims. Israel would like to murder Palestinians as quietly as possible and steal their land as quietly as possible. But when a Muslim leader such as Erdogan or former Malaysian Prime Minister Mahatir Muhammad speaks up against Israeli Nazism in Palestine, the Zionists lose their balance and mental equanimity. We all remember with admiration how Erdogan, the son of Islamic Turkey, courageously confronted Israeli President and war criminal Shimon Peres on 31 January, 2009 in Davos, Switzerland and then walked out of a televised debate, after the moderator refused to allow him to speak to refute Peres' lies. Erdogan was indeed the voice of the voiceless Palestinians when he spoke these beautiful words that came from the heart. His remarks were more truthful and more honest than a thousand hypocritical speeches by western leaders and morally bankrupt Arab officials whose ultimate preoccupation is to satisfy and please their own tyrants and presidents for life. Now, Erdogan speaks once again on behalf of the voiceless and thoroughly persecuted people of Gaza, the very people who are being punished by brother and foe alike for not selling out their national honor and dignity for a piece of bread as some large Arab nations have done. In a news conference held on Tuesday, Erdogan, reiterated his government's position that any reconciliation between Ankara and the Zionist regime would be contingent upon an Israeli commitment to end the siege on Gaza. "The compensation talks on behalf of the victims of the Mavi Marmara, which are taking place between Turkey and Israel, have not concluded," Erdogan said. "In the final stages, there will be a need to include a clause in the protocol that calls for the lifting of the siege on Gaza." Needless to say, Erdogan's remarks shocked Zionist leaders who wrongly thought that the Turkish leader was seriously weakened by the recent domestic crisis, including demonstrations by leftists and extremist Alawites protesting Turkey's backing of the Syrian revolution against the Nazi-like regime of Bashar el-Assad. The barking dogs of Zionism and anti-Islam Arab nationalism will continue to attack Erdogan and wish him ill. They will continue to make all sorts of innuendoes and insinuations about the Ottoman state, the very state that protected the Arabs from earlier European colonialism for 400 years. Indeed, had it not been for the Ottomans, most present Arabs would have been speaking French, Spanish and Portuguese. But many Arabs, especially those contaminated with the germ of secular nationalism, are a people bereft of morality, honor and dignity. Otherwise, they wouldn't be kissing the hands of the enemies of Islam while trying to cut off the hands of their brother Muslims. But Turkey's Ship shall continue to sail, undisturbed and disquieted by the conspiracies of cheap, treasonous Arabs who shamelessly declare that "What unites us with Israel is greater than what divides us," as the Foreign minister of the so-called United Arab Emirates was quoted as saying recently. We in the Arab world are accustomed to being affronted by such little men. What else can one say of Arab "statesmen" who think that the occupation by Zionism of al-Aqsa Mosque, Islam's First Qibla, is insignificant and shouldn't have any effect on relations between Arab states and Israel. The Prophet Muhammad (peace be upon him) did allude to the coming of a time when such little men appear and occupy center stage. The holy prophet said: "There will be years of great deception in which people will disbelieve one who tells the truth and believe the liar. They will distrust one who is trustworthy and trust one who is treacherous. And the Ruwaybida will speak." They asked: "What is the Ruwaybida?" He said: "The minor scoundrel (al-Fuwaysiq) who will have his say in general affairs." Unfortunately, the Ruwaybida phenomenon is the norm not the exception these days. After all, we live in the age of Ruwaybida. The Israeli Government of Prime Minister, Benjamin Netanyahu, stated that Tel Aviv does not agree to the Turkish demand to lift the siege on the Gaza Strip in exchange for a reconciliation agreement between Tel Aviv and Ankara. The Turkish demand came on Tuesday when Turkish Prime Minister, Recep Tayyip Erdogan, stated during a press conference in Ankara that his country received an apology from Israel, and talks for compensating the families of nine Turkish peace activists, killed by the Israeli Navy while sailing to Gaza in 2010, are still ongoing. The Turkish solidarity ship, Mavi Marmara, part of the Freedom Flotilla that was sailing to Gaza to challenge the illegitimate Israeli siege on the Gaza Strip and deliver humanitarian supplies, was attacked in international water, and nine Turkish activists were killed by Israeli fire. Erdogan said that lifting the deadly blockade on Gaza is one of the conditions that his country will not drop, and that without lifting this siege, there cannot be normalization with Israel. Israeli daily, Haaretz, has reported that the Office of Netanyahu said “the Turkish conditions will not be met”, explaining that Tel Aviv will not lift the siege on the coastal region, and will never, sign a written agreement pledging to lift the siege. The statements came after Turkish Foreign Minister, Ahmet Davutoglu, stated last Monday that Tel Aviv and Ankara are very close to signing an agreement normalizing the relations between the two countries. In a study published by Haaretz a week ago, Israel made an offer to pay the families of the nine Turkish victims, and those hurt in the attack, $20 Million, and that Netanyahu even authorized his envoys to pay up to $23 Million. Tel Aviv is seeking to have Turkey drop lawsuits filed against its officers involved in the attack, and to normalize relations between the two countries. It also wants Turkey to pass a law that would cancel all pending lawsuits files against it, and to ensure the law blocs any future legal actions, locally and internationally. Haaretz said Tel Aviv does not only want a symbolic normalization of relations, but also full relations, including diplomatic talks, mutual visits of officials and ministerial talks. Turkish Prime Minister, Recep Tayyip Erdogan, demanded that Israel lift its blockade on the Gaza Strip in order to secure his signature on an agreement between the two countries. According to the Palestinian News Network (PNN), Erdogan said, in a press conference held in Ankara with his Spanish counterpart Mariano Rakhoi, Wednesday night, that significant progress had been made in the talks with Israel. Israel Channel 2 quoted an Israeli official as saying that Israel will not agree to ease the Gaza blockade as a part of the deal it is negotiating with Turkey. Relations between Ankara and Jerusalem became strained after a raid on the Turkish-owned vessel, the Mavi Marmara, in May of 2010, to enforce a naval blockade of the Gaza Strip. Nine Turkish citizens were killed in the raid. Turkish Prime Minister, Receb Taayib Erdogan, said Tuesday that Israel should lift the siege over the Gaza Strip as a condition for signing a reconciliation agreement and normalizing relations between the two countries. 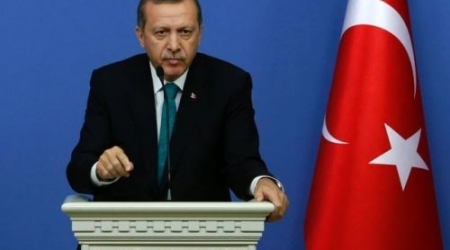 Erdogan said at a press conference in Ankara alongside Spanish Prime Minister, Mariano Rajoy, that Turkey will not accept less than a written approval from Israel to lift the siege imposed on the Gaza Strip, Israel's Haaretz newspaper reported yesterday. The Turkish Prime Minister pointed out that there is a progress in the ongoing negotiations with Israel but it is not over yet. He added that Turkey has received an apology from Israel, and that talks over compensation for the families of those killed and wounded on the Mavi Marmara ship in 2010 are ongoing. "Nothing will happen without lifting the siege on Gaza," he said. Hebrew media reported recently that the negotiations on compensation for the families of those killed on the Mavi Marmara has progressed significantly and that Israel has offered to pay $20 million in compensation to the families.